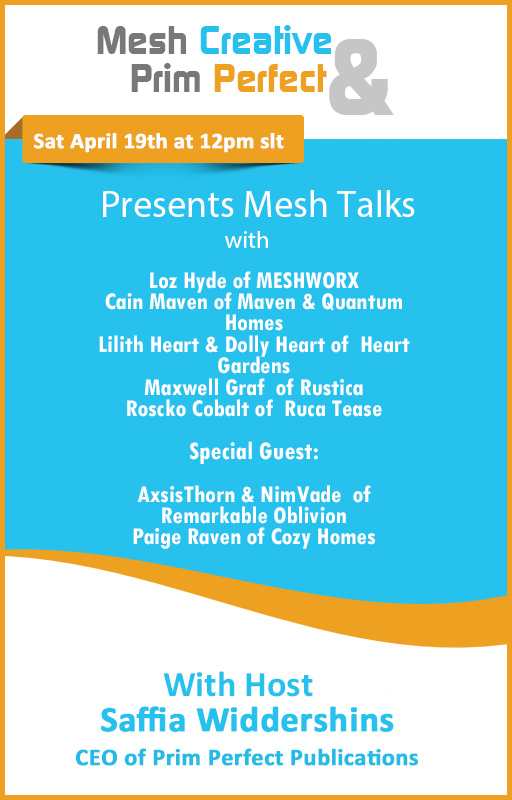 Mesh Creative and Prim Perfect combine for another Mesh Talk! Join us at the new Prim Perfect Headquarters in Sund, Second Norway, for the latest of our popular talks, produced in association with Mesh Creative. As you can see from the poster, we have a great line up of regular speakers and guests. These top designers will be talking about their work, showing examples and discussing problems that they have encountered. They’ll give advice, share ideas and insights into the creation process. There’ll be ample opportunity for you to ask questions too. So do come and join us at 12 noon on Saturday 19th April at the special studio above the Prim Perfect offices on Sund! And take a look at the offices too! Previous Post: Designing Worlds is more than a little Greedy – now on the web! Next Post: Cinders goes Egyptian for Happy Hunting this week!